*Please note the size chart before you select your size. Our tee's are design to be fitted across the chest, shoulders and arms, yet long in the body. You may need to order a size up from your normal size. Our custom designed gym tee is the ultimate aesthetic enhancer, designed for the bodybuilder it’s, tight and cut in all the right areas. For days when you want to cover up a little more, choose our BP classic gym tee with round neck and short sleeves. Ideal for off-season, for wearing to and from the gym, or just for days when you want an easy option for wearing around the house. Quality cut and finish, super-soft fabric, this tee will stay looking great wash after wash. It's set to become your new favourite gym tee. This T-Shirt is simply awesome, i didn't hold out much hope for it as usually SUPPS Promo gear isn't the greatest quality but i have to say this T-shirt exceeds all expectation. The cut and fit are superb, nice and snug in the arms but still loose enough in the torso so it's comfortable. Best part for me is the length, I'm a tall guy so finding a T-shirt that fits nice in the arms and chest usually means it isn't long enough but this T is the perfect length. Great stuff to train in! It's hard to find a training shirt that is comfy, light and feels cool through those tough workouts! Another quality product from bp, best fitting tee i have bought in a long time, nice tight aesthetically enhancing fit with plenty of length which is good when you're tall. 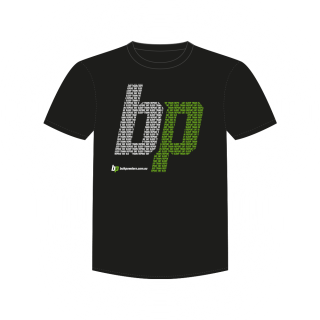 Awesome design and fit thanks bp!